In the previous issue we talked about September the season of success. Well for most of us September brings special memories to our mind. 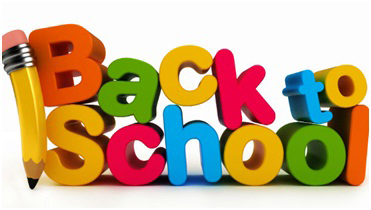 Yes you guessed it, it is the "Back to School" month! Remember when we were kids, how our parents used to prepare us for the next scholar year? 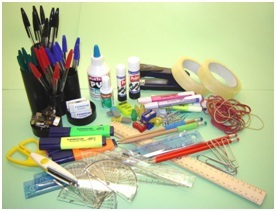 It all starts with a stationery need assessment. What's available vs. what's needed? Bags, notebooks, pencils, pens… and the list goes on. I bet you all remember those new pencils odor, or those new notebooks paper smell, we couldn't wait to write our name on them so we can feel that they belong to us, a comforting sense of ownership. The next phase is the scholar books. After receiving the assigned list from our school we start to compare it with last year, what novelty could this year brings in topics & material. On the other hand September is the high season for libraries, bookshops, copy centers and stationery providers. Think about it at least one person of each family is in charge of these scholar tasks. The question remains, where to go? If you run a business that offers scholar services and products, now it's the time to promote it, and promote it well! Use your resources wisely. Don't just spend thousands of dollars on advertising and expect a high return on investment. Marketers must know that. It is all about the Message that you promote. Think about your audience, are you targeting parents or children? Go back in time, remember what made you happy? What pushed you to ask for a certain products or brand? What factors played a major role in your decision making as a child? What was your parents' perception of your needs and what pushed them to react? Your message must be short and straight to the point, reviving that nostalgia feeling pushing parents and children to take action. 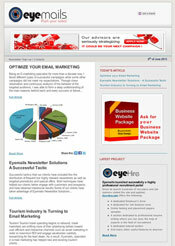 At Eyemails we offer you a cost efficient marketing tool; we offer you the chance to reach thousands of people. With a simple design and the right message we have a proven success formula. Moreover, we encourage our customers to send multiple e-mail shots with different messages and visuals. We believe that e-mail marketing should bring an added value each time a subscriber receive and promotional e-mail, unlike billboards that keep repeating the same message as if it was a brain wash, not to forget its high cost compared with e-mail marketing. Instead of wasting thousands of dollars on billboards and other marketing media, with less than USD 100 you can target thousands of potential clients. Are you not publishing a newsletter because of the costs of printing it or mailing it? Emailing and posting your newsletter online can be a great way to save money and get your news delivered to your readers' inbox. Sooner or later every school will have their own schedule for removing or reducing their paper based newsletter. For a smooth transition, we recommend to start promoting your web version around 3 issues (newsletter can be weekly or monthly) prior to launching your digital newsletter. Start running both the online and paper based versions together, but with every issue somewhere includes a brightly colored slip or banner on the front of the print newsletter that boldly says. "We are moving to a paperless newsletter system on Dec 1st, 2013 in an effort to better communicate with our readership and remove waste. Please fill out newsletter subscription form on our website to ensure you get our newsletter sent to your computer or smartphone." Following that you stop handing newsletters to students and have maybe 30 copies available for parents or students to collect at the school office. This covers anyone who has not signed up yet, but will also give your office staff the chance to verbally inform them of how to sign up online. Make sure to have an unsubscribe button so that subscribers can opt out at any time. As you know, parents need a tool to rely on for information and important notices. Your newsletter enables parents to feel more connected to your school. • Building stronger community relationships. Newsletters can remind families about important dates, promote student achievements, and help parents understand elements of teaching and learning. If you are responsible of the school newsletter we recommend that you consider collecting sample newsletters from other schools to find fresh ideas for your newsletter. Maybe everyone won't read your newsletter, but many parents will. A newsletter is a great way to help build your relationship with the home and assist parents with practical ideas. Think ahead and plan your newsletter. How often do you want to communicate? What will draw parents to read your newsletter? What will draw students to read and interact? Then assign a person or more in charge of developing the newsletter topics. "Make communication a shared responsibility. From time to time take a good look at other communication networks going out of your school to see if there is a way to consolidate all that goes home and to maximize readership. If you are going to commit to a monthly newsletter, it is important to be prepared for it. A newsletter is a wonderful means of communication with parents and students. Make the best of it. 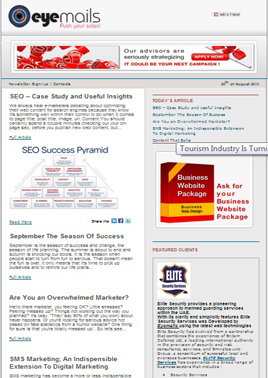 The software used to produce your newsletter can be another key element of its success. 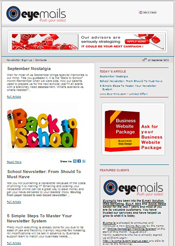 Eyemails Newsletter system can be easily installed on your school network. You may chose to provide admin access to the people in charge of the content generation. • Have a standard template design so that you don't have to reinvent the wheel each time, and be sure to assign someone that you trust proofread. Remember, that newsletter is your ambassador for the school, so you want it to be a good representative. It can be positive, powerful PR. • It is essential that "your newsletter's message speaks to the reader rather than at the reader. • Make the newsletter as appealing as possible, then post it online and invite community members and alumni to sign up to receive it electronically. • Make your best articles permanently available on your Web site, and post your newsletter as often as it comes out. Each time a newsletter released, give the readers an incentive to read. Perhaps you can add catchy riddle that readers need to solve. The first person, or perhaps the first 5 or 10 people, to solve the puzzle win a prize. You could make it relevant to upcoming school activities: for instance the prize could be tickets to an upcoming school play or recital. Or, the prize could be museum tickets or a gift card. Although you might have a person in charge of developing the content of your newsletter, it is important to involve your students. If Give each class, an opportunity to participate by creating topics of their concerns. Different classes can be responsible to creating the stories that appear in the newsletter. In addition, classes would learn how to create and gather news events for a publication and how to work together on a large task. Many schools have taken a step towards creating a paperless solution such as posting their newsletter to their website or creating email lists. Eyemails offers rich reporting and analytical tools to determine how many people are actually opening your messages, clicking your links and reading them. This is crucial information and this is the main reason we recommend Eyemails newsletter over any other service. Pretty much everything is already done for you due to its ease of use and flexibility. It simply requires few tweaking. All modifications will be set in advance by Eyemails support team to match your business needs. Before we get started we are going to assume that you have the following. • An existing business website. 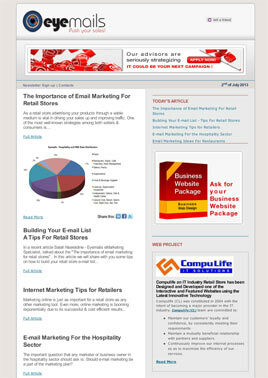 • A copy of your newsletter saved as a PDF, Word document or something similar. Our support team will install and configure the newsletter system on your network and will give you access to the entire suite of features. Fill out the form with your design template, add a title and select your list of subscribers. 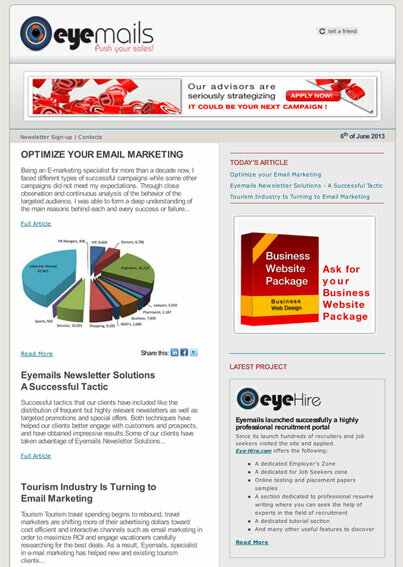 Eyemails newsletter system is generally used by companies and websites to keep customers and clients in informed of the latest news and upcoming events. You may design your own template or ask Eyemails to provide you with options to choose from. We won't get into great detail about this as there are so many different options for businesses to do this, but essentially you just want to have a page on your business website that links all of your recent newsletters as PDF files. This way your website users can have access to your newsletter archives and may choose to subscribe for the coming issues. Links to your business social media networks are essential these day. Make sure you add your business social media icons and link them properly to your accounts. You need to create a sign up form which will appear on your business website that will allow visitors to sign up. Once again this is a very simple action that can be appreciated by many readers, especially those who directly interested in your products and services. 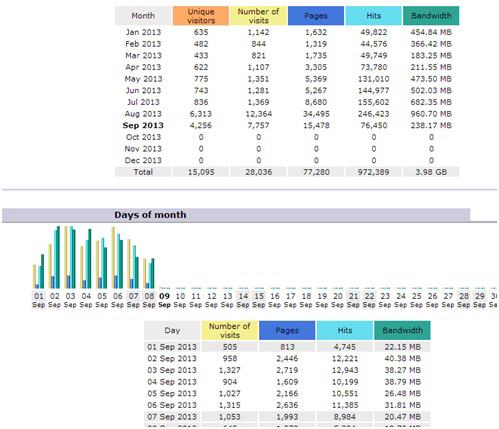 Step 5: Promoting your new online newsletter and tracking how many people are reading it. These statistical numbers can be backed up with your website google analytics which will reflect exactly the traffic generated from your newsletter to your website. By analyzing and interpreting these number you are able to form an overview about the impact of your newsletter, and to identify which topics are generating more traffic and are more likely to generate potential leads. 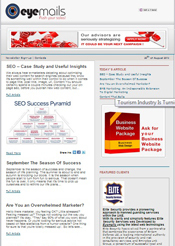 Your newsletter is now an additional tool for online market study. Eye-hire is a new professional recruitment portal launched by Eyemails. Eye-Hire brings closer the recruiters to the job seekers. Since its launch (May 2013) thousands of recruiters and job seekers visited the site and applied. Benefit now from this limited offer, and post up to 5 vacant positions for free. Let your vacancies be seen by thousands of job seekers. In addition benefit from an unlimited number of CV drawn right to your posted vacancies. With a full access to the candidates resume and contact details, you will enjoy selecting the right candidates for your vacancy. This offer is only valid until the end of October. So hurry up, take the initiative and register.